By Jared Feldman and Frank Kavilanz . Published on April 02, 2018. It's easy to get discouraged when scanning headlines about Facebook's News Feed algorithm changes. Beginning in 2018, content posted by friends takes priority over content posted by publishers and brands. What does this all mean? The reality is these changes did not happen overnight. Facebook has modified its algorithm over a few years to refocus the user experience on personal connections and community. And with these changes, content that motivates people to love, share and comment is now more valued, meaning it's seen by more people. This opens up opportunities for publishers and marketers who know how to connect with their fans on a deep, emotional level. Beyond bucking the algorithm, why is hitting a home run on emotion important? Marketing science shows that most purchase decisions are made with the heart, not the head. And emotion triggers engagement on social media, which leads to lifts in brand awareness, perception and purchase intent. 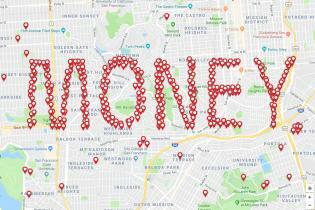 In particular, branded content published by media companies on behalf of marketing partners has emerged as a viable and growing strategy, capturing 29 percent year-over-year gains in engagement on Facebook, according to Shareablee. And it's effective for marketers. Per ListenFirst, branded content published by media companies is delivering 12 times more social engagement than content posted by advertisers. We are now in the emotion business. Great branded content that reaches the right people can produce a powerful emotional response, which leads to engagement and results for marketers. But in today's world of distracted audiences, creating an emotional connection is easier said than done. Turner and Canvs, the industry leader in measuring emotion, partnered to better understand the value of emotional reactions to branded content. 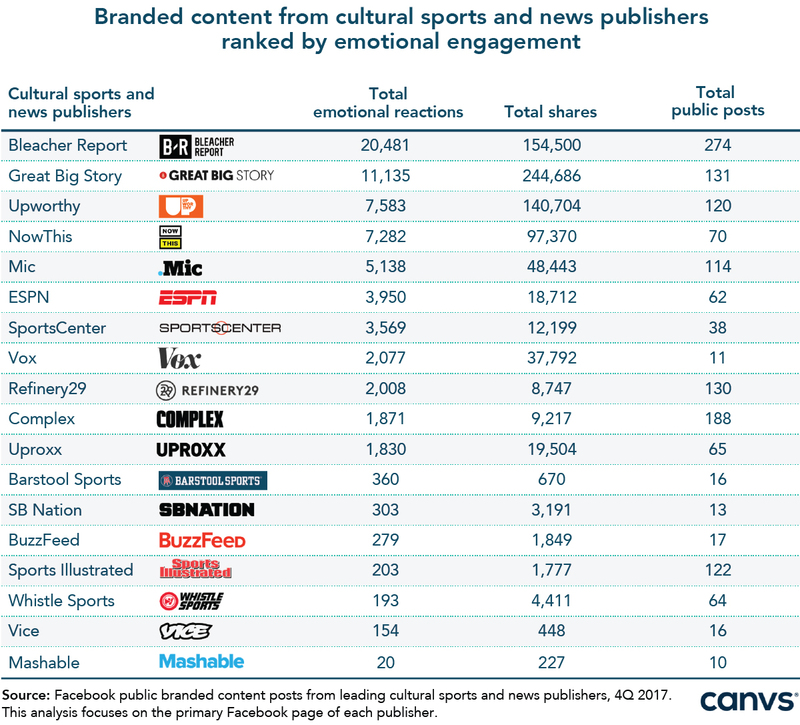 As a starting point, Canvs analyzed all public branded content posts in Q4 2017 by two of the leading categories on Facebook: cultural news and sports publishers. For this analysis, Canvs focused on the primary Facebook page of each publisher. The data surfaced a few key takeaways. Quantity doesn't necessarily translate to more emotional reactions. 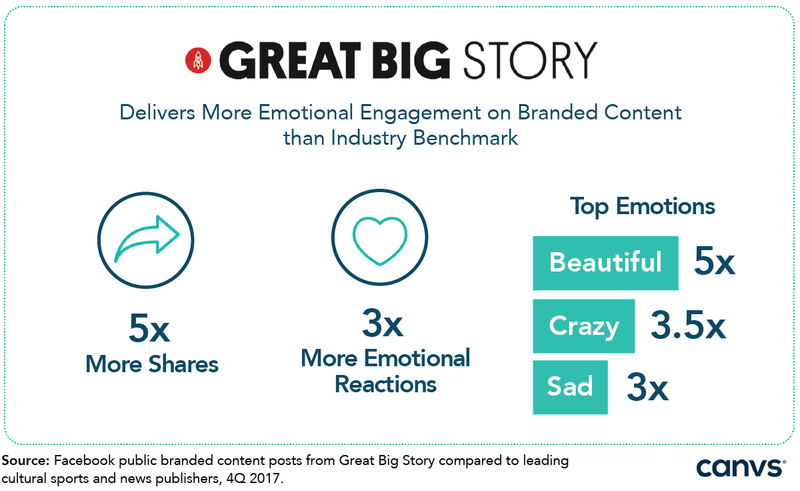 As the data showed, publishers that rank high in volume of branded content posts have varied scores for emotional reactions. Chasing scale on Facebook doesn't always translate to meaningful engagement and emotion. One publisher that stood out in successfully unlocking emotion to branded content is Bleacher Report, a division of Turner. 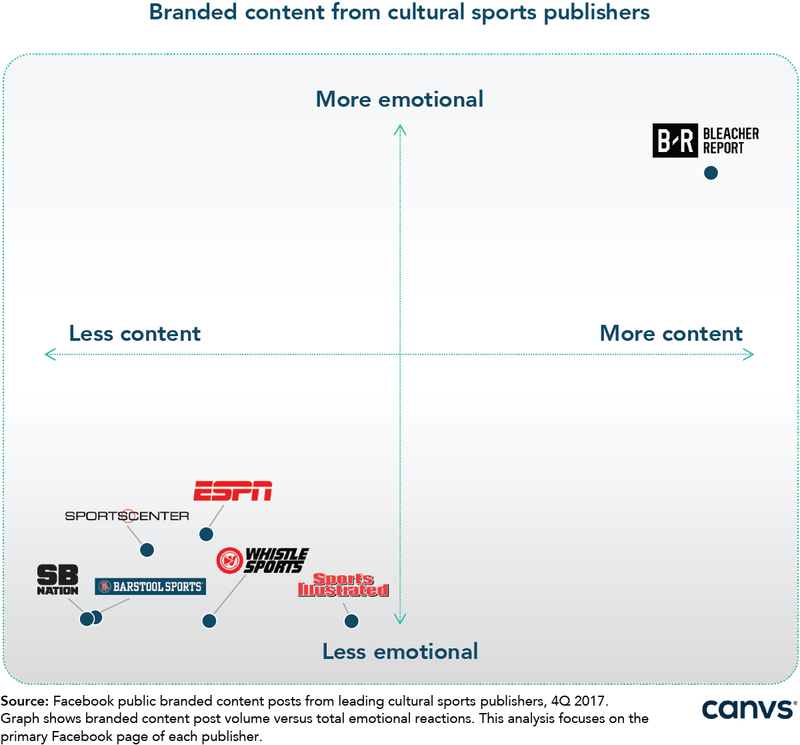 Bleacher Report created the most branded content posts, while also driving the most emotional reactions. This unique combination is even more apparent when looking specifically at the cultural sports category. Bleacher Report created 47 percent of all public branded content posts, while delivering 70 percent of all emotional reactions. Not every branded content post on social media is created equal, and the impact for marketers depends on aligning with content that appeals to existing fan bases. 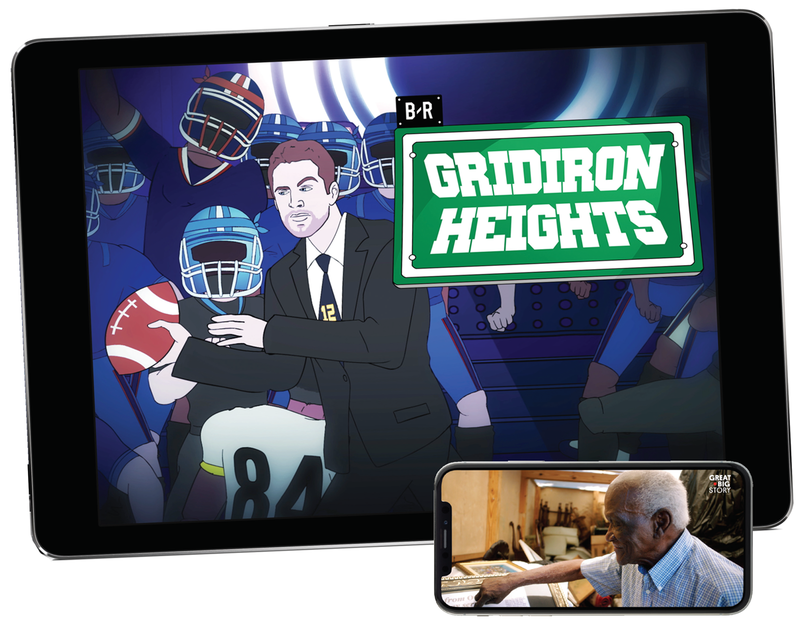 In Q4 2017, Bleacher Report's success was led in part by PlayStation's editorial sponsorship of the wildly popular video franchise, "Gridiron Heights." The video "Rodgers Is Ready to Go John Wick on the NFC" produced the most emotional reactions of any branded content post measured, generating 148 times more "funny" reactions and 41 times more shares than the average post. There is a strong correlation between emotional reactions and shares. Publishers who produce strong emotional engagement to branded content are also driving the highest rates of social sharing. 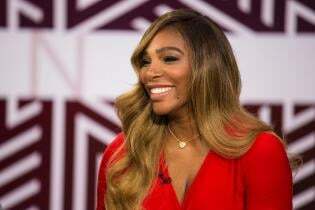 Great Big Story, a cinematic storytelling company owned by CNN, generated the most shares of its branded content, and sparked the most "beautiful" reactions across leading cultural news and sports publishers. A driver of this response was Great Big Story's partnership with MassMutual, which recognized unsung heroes of 2017 during the relevant moment of New Year's Eve. As part of the campaign, social insights were used to identify six uplifting stories, and custom branded content was produced to profile real people helping others. A highly engaging video in the series, "Rebuilding a Home for a World War II Veteran," drove 10 times more shares, 27 times more "crying" and 23 times more "happy" reactions than the average post in this study. While this analysis begins to scratch at the value of emotional engagement, initial takeaways are clear: Branded content that taps influential intellectual property with deep fan relationships delivers the highest emotional response. With Facebook's algorithm change, we're also starting to witness a shakeout among players who don't have the established fan bases, content and quality production to pack the emotional punch. 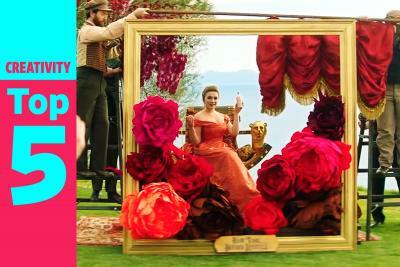 Heavy competition with marketers pushing for premium video and audience credibility will only accelerate this movement. As the social landscape continues to adapt, marketers must understand the data available and find the right partner to create content that connects emotionally. After all, emotion is the new entry point to achieving engagement and results on social media. WarnerMedia is a leading media and entertainment company that creates and distributes premium and popular content from a diverse array of talented storytellers and journalists to global audiences through its consumer brands including: HBO, Warner Bros., TNT, TBS, truTV, CNN, DC Entertainment, New Line, Cartoon Network, Adult Swim, Turner Classic Movies and others. As the Founder and CEO of Canvs, Jared Feldman is working to improve how television networks, content creators, and advertisers measure the impact of an audienceâ€™s emotional reaction to content. When he founded Canvs in 2014, Jared created a robust qualitative research offering which has become the industry standard for emotion analytics. 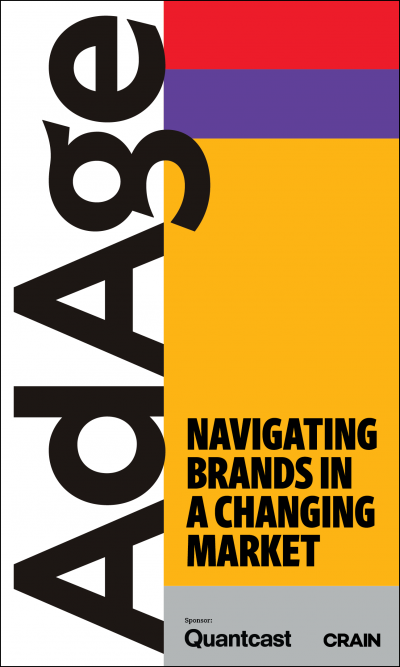 Thanks to Jaredâ€™s continued vision, Canvs was recently named as one of the most innovative companies in measurement by the Advertising Research Foundation and is the trusted measurement partner for clients such as Disney, Netflix, Sony Pictures. He was recently included on the Forbes â€œ30 under 30â€ list in the Marketing & Advertising category and was a recipient of a 2017 ARF Great Minds Award. Kavilanz oversees Turner's global social agency, which is dedicated to the strategy and distribution of content-driven campaigns for brands into social media and beyond. Since joining the company in May 2015, Kavilanz led the development of the company's social distribution capability, called Launchpad, from the ground up. Launchpad now includes a dedicated team of social advertising experts, and a social advertising approach that leverages data across Turner's 800M global social followers. 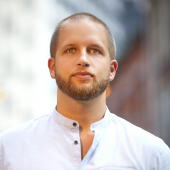 Prior to joining Turner, Kavilanz was general manager of Partnerships and Revenue at Bedrocket Media Ventures. 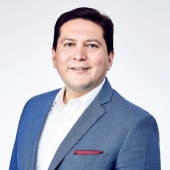 He has also held leadership roles at NowThis News, NBCUniversal News Group and Disney ABC Television Group.